'All About Presentations' by Jazz Factory: What is the ideal font size for a presentation? What is the ideal font size for a presentation? Recently I put up a poll on the blog asking readers "What font size they mostly use in ppts?" 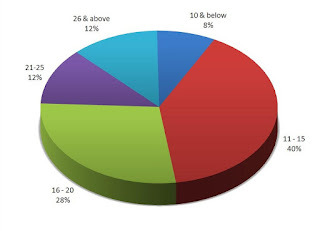 The answers were very surprising: 40% readers use a font size of 11 to 15, another 28% use 16 to 20. 76% of the readers use a font size of 20 and below. Is 20 and below the ideal font size? What's ideal depends on your medium of delivery: whether you are emailing your presentation or you are going to physically deliver it. If you are emailing, do not go below font size 18 for body text and 26 for header. Remember, the bigger the font the easier it is to read the presentation. If you are delivering the presentation personally on a projector then I advise a minimum font size of 24 for body and 34 for header. What is the role of font size in your presentation? It makes the text easy to read. Remember, the audience member on the back should be able to read the slides without any problem. Knowing how large is your audience will help you decide your font size better. The larger the audience size, the bigger will be the venue and the larger the font you would need. Is there a better way to figure out the ideal font size? There is. If you know your venue you can actually figure this out easily. 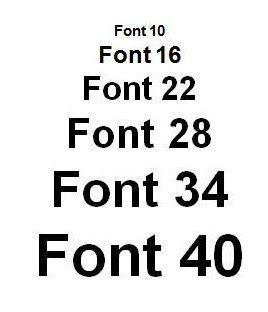 When I was making presentations in my college classroom, the minimum font size which was visible from the last bench was around 24. I figured this out by actually going to the classroom earlier one day, putting up my slides and going to the last bench. If you are familiar to with the venue, its your conference room or classroom, then try this out. Go to the venue, project your slides and see what font size is clearly visible from the last row. If you are unfamiliar to the venue then think about the size of the audience. When in doubt, always go for a bigger font. What font size are you currently using while delivering presentations to clients or in the classroom? If you are using a font smaller than 24, then I would like to know why? How did you decide on your font size? Leave a comment.